I have been mostly a power tool woodworker for years. But I want to add a few planes to be able to tune my projects, building drawers and flattening surfaces. I am considering a No 5-1/2 and a No 7. I understand that the same frog is used in each and a standard is 45 degrees. I heard Rob Cosman say since the 4-1/2, 5-1/2, and 7 use the same parts, it would be advantageous to get one in a higher angle. However, I have never seen a video where someone swapped frogs in a plane for a particular task. I don’t see the reason to get all 3 right now. Would you get a 50 or 55 for the second plane? JACK and TRYING planes have edges which are cambered (read “curved’) to hog off material from lumber getting it down to size. 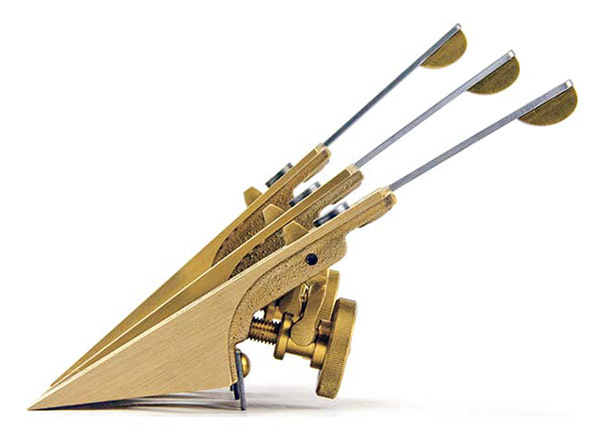 The Jack is used first, then followed up with the Trying (read “true-ing”) plane. It doesn’t sound like you will want to use either of these for your work. It looks like you will want to start out with just a smooth plane, which has a squared blade for fine tuning drawers and the like. You will also want a low-angle block plane for working on end grain. (ALWAYS from the ends INWARD, and NOT all the way across) Once you’ve gotten comfortable using these two basic planes, then you might want to consider adding a jointer. While Stanley and Bailey are generally considered “desirable”, don’t get too hung up on makers and numbers. Remember, these same companies made planes to be sold by other firms who put their own names on them. BTW, a Stanley 55 is a highly complex combination plane. They can do a lot of work, but it takes a while to learn how to set it up for each function. For flattening surfaces of panels, my go-to is a 5 1/2. My 7 is usually for edge jointing for panel glue ups. For finish smoothing, the 4 1/2. The high angle frog Ron Crosman advocates is best for highly figured woods like curly maple. I’ve never had the need, I use a 112 scraper for that work. 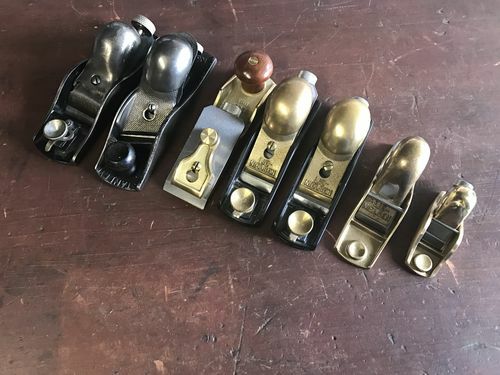 Note that the older (pre 1938) Stanley 5 1/2 planes DO NOT have the same width frog, iron and chip breaker as a 4 1/2, 6, and 7… Early 5 1/2 irons are 2 1/4”, later 5 1/2s are 2 3/8”, matching the 4 1.2 thru 7 size planes. Likewise, I’m confused by your wanting a 50 (a light plow plane), and a 55, the most complex combination molding, plow and beading plane Stanley made… Not even the same class as the 4 1/2 – 7 bench planes. My $.02… The Kentucky Toolsmith! I’d have to recommend a 5 and a low angle block plane to get you started. Once you get the hang of keeping them sharp then you can consider some others. Learn to keep them sharp and they will do wonders. Pick your method and stick with it until you master your sharpening method. Sharp has more impact on plane function than frog angle by an overwhelming percentage. Can’t imagine switching frogs on a regular basis. And no, I’d never recommend a No. 55 as a second plane. I was not clear in my original post. I am considering purchasing No 4-1/2, No 5-1/2, and No 7 planes. They are all available with options of frog angles at 45, 50, and 55 degrees. My understanding is the standard frog is 45 degrees. Rob Cosman mentioned since the frogs are interchangeable on these planes it may be advantageous to get different angles and swap them to the job at hand. Having used mostly block planes up to this point, I was looking to more experienced craftsman teaching how they used the others. Of course, in a cabinet behind their workbench they have planes maybe worth $4000 or more. Having improved my skills, or at least my confidence, I am returning to hand cut dovetails, and that led me to Mr. Cosman. He suggested starting out with the above 3 mentioned planes. But I do not want to make that investment in new planes all at once. I picked two, and chose the 5-1/2 and 7. I saw the No 5 as a smoother and good all around plane. I chose the 7 to flatten large boards, bench tops, and joint edges for gluing tabletops. Both could be used on a shooting board. Maybe the first question I should have asked is what two planes to buy next. I have no power jointer. I’ve been using a track saw or track router to edge joint. I have a few block planes. For general work, I would stick with the standard 45 degree frogs. As Smitty mentioned, sharp has the most impact and a sharp, well set up plane with a standard frog will do the vast majority of the work. If you are frequently working with hardwoods that are prone to tearout (figured, interlocked grain and quartersawn with prominent rays, such as oak or sycamore) then I would add a higher angle smoothing plane such as a 4 or 4-1/2 size. Higher angle is good for those situations, but comes with trade offs. They require more force to push and need sharpening more often. It’s slight and relative, but real. Higher angle is also not as good for end grain, so not desirable for a shooting board. I like, use and build 50 degree smoothers, as they are more versatile and the downsides aren’t as magnified. Unless I was spending most of my time working figured woods, then I would stick with standard angle for jointing and flattening panels of straight grained wood. I use power tools for all the grunt work and hand planes more for trim and final prep work and panel flattening. I also do not have a power jointer. I would have recommended a 4-1/2 instead of the 5-1/2 (it and a #5 are the my least used planes), and would be the next one to get. Mine does smoothing finish prep on everything unless its a narrow surface, then I use a #4 and then a block plane as surfaces get narrow/smaller. If you work with figured wood higher frog angles or scrapers are required. Scraper planes excel at this (see here). Also, everyone should have a #4 – just watch some Paul Sellers videos and you’ll see why. It sounds like you have purchased new high end (probably LN?) planes. A well tuned refurbished plane performs very well and can save a lot of $. My blogs here and here may help you out. The standard angle planes will suffice. Unless you are milling stock by hand, just the 4 1/2 and 7 will do. Personally I am very partial to my #6 which is basically a 5 1/2 but a little longer and useful for jointing boards under 24” long. I use either a LA jack or #6 for flushing drawer joints, but any plane will do the job. What plane brand are you considering? To swap frogs like this would require newly manufactured premium planes (e.g. Lie-Nielson). I would also recommend a low angle block plane as a first or early plane acquisition. Also, the #6 shares the frog size. Thanks Wayne. I am looking at a few as well as used – LN, Veritas, Wood River. I have a couple of block planes – a LN gifted to me maybe 15 years ago, and a wooden plane that once I learned how to set the blade, I truly enjoy using. I have used it more than the LN. and I don’t know the angles on any of them. I can’t image a 5 1/2 as a first. Buy a normal #4 smoother. You can decide on new or vintage, but you won’t be sorry. You will use it forever and so will your kids if they take up the craft. All this hype and marketing is just that, hype and marketing. And yes it’s been going on for 150 years. I have to go with Don. a 5-1/2 and 7 as the first two planes in a stable seems rather redundant really. I would also recommend an adjustable mouth block plane. Stanley 9 1/2, 18 or 19 standard angle block planes or Stanley 60 1/2 or 65 block planes as examples. Basic choices are low angle vs standard angle, size, and knuckle block or non-knuckle block. Several of you recommended a 60-1/2. Or 62 Low Angle Jack Plane. Will these work well on a shooting board? In my research, I’ve heard of using any from a No 5 to a No 8 for shooting drawer sides square and bringing sides to the same width. The No 8 recommendation came with a caveat of requiring a lot of strength to wield it. It does seem an unreasonable choice. If I use a No 62, I notice it is lightest on the list. At 4.5 pounds, does it have enough mass to develop the momentum to be easy to use as a shooting plane?